Season 2 of Tennessee Capitol Report debuted on Tennessee’s PBS stations on January 31, 2016 with an overview of new legislation before the 109th General Assembly. The show also featured a “day-in-the-life” feature with Lt. 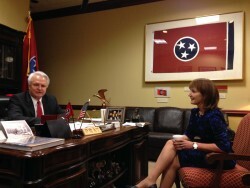 Governor Ron Ramsey. The Tennessee Senate will reflect his influence for years to come. Check out the video section to see the show. TCR will air through early May.